Interests - Riding his bike, Lego, Ben 10, The Simpsons, SpongeBob, Phineas and Ferb, Moshi Monsters, cars, dinosaurs, drawing, books, Wii, Nintendo 3DS XL and kinect games, animals, cooking, Manchester United, collects snow globes. Doesn't eat chocolate. 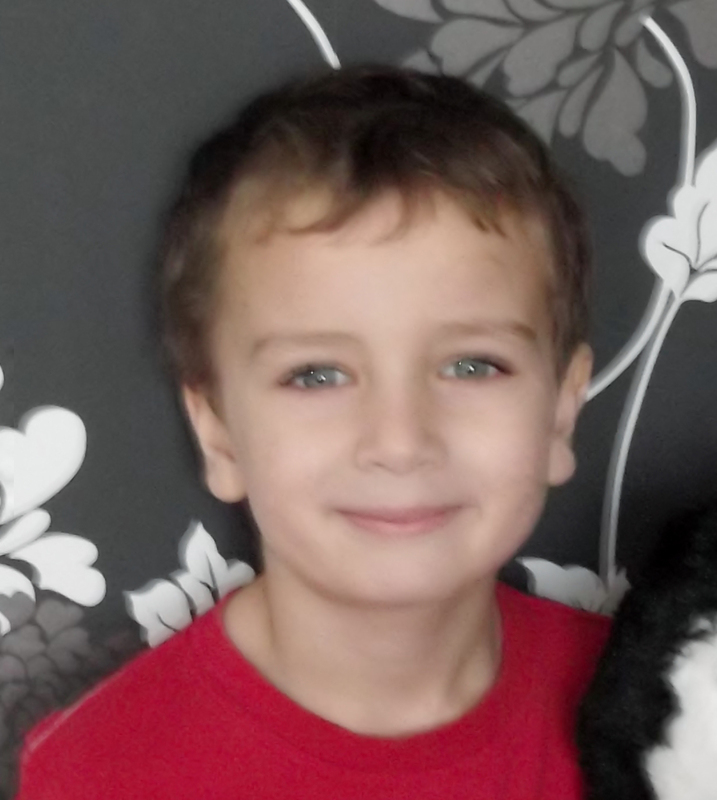 Xander was diagnosed with X-linked agammaglobulinaemia (XLA) at 18 months old. He had always been sick as a baby and always had a cough and cold. When he was just over 12 months old, Xander got cellulitis in his hand which travelled up his arm and into his blood stream within 24 hours. He was given antibiotics which didn’t work so had to be admitted to hospital for IV antibiotics. He was only out of hospital for a short while when he became very sick one night, so we took him to A+E where they found he was neutropenic. They transferred him by ambulance to a specialist hospital where they did a bone marrow test, but the doctors still didn’t know why he was so ill.
Xander then had 6 weeks worth of blood tests and was finally diagnosed with XLA. Since diagnosis, Xander has had an abscess on his neck that he had to have surgery on twice, and the cause of this was a flesh eating bug called necrotising lymphadenitis. Xander has to have blood plasma twice a week which is infused into his leg and the amount will get more with age. It takes 3 hours each time to infuse the blood plasma. He will have to have this medicine for the rest of his life as Xander’s condition is not only life threatening but incurable. He has to have a lot of antibiotics too, some long term. We also have to keep everything extremely clean to stop him getting germs. We have decided that although Xander’s condition is incurable and the future is uncertain as to how his illness will progress, that it is time to let someone else take Xanders place with Post Pals and enjoy all the lovely cards, letters, postcards and gifts that he has received over the last few years. We would like to thank everyone who made Xander smile over the years and you will be remembered and we will always be grateful for everything that Post Pals and the volunteers have done. So ‘goodbye’ and ‘thank you’. December was quite a quiet time for us as a family, we had a peaceful Christmas with no journeys to the hospital etc which is always a bonus, and because of family commitments this year there was only the five of us celebrating Christmas. The boys got lots of lovely letters from the ‘reindeers’ and some lovely presents from the ‘elves’ along with lots of goodies from Santa. Xander got lots of Lego which some still hasn’t been built yet and Killian got a mobile which he thinks makes him a big boy now as he’s going to high school this year, which is frightening. However Santa didn’t bring everything they wanted as they both put dogs on their list, Xander wanted a Husky and Killian wanted a golden retriever. I had to explain that santa doesn’t bring animals. We would like to thank all the reindeers and elves for their lovely letters and presents, Marty, Christine, Dolores, Jake, Millie and Fly, Hitchhiker, Jenny, Sarah, Elizabeth, Shofner and Amelia. I apologise if I haven’t mentioned someone but hopefully I have remembered you all. Earlier in the year we had a phone call from a charity called ‘Childflight’ who said we had been nominated for a holiday to Florida by Xander’s immunology nurse. We had to fill in lots of forms and wait to see if we were accepted, but the short story is that we were accepted. So on the 29th October we flew out of Manchester Airport with 55 other families to enjoy 10 days in the sunshine and do the Disney parks and Universal Studios etc. We were accompanied by doctors, nurses, and everything was paid for and the charity made us all feel very special, especially Xander. We had a lovely time and the boys met lots of the Disney characters and went on lots of rides and of course bought lots of Lego from the biggest Lego store I have ever seen. Generally, while we were away everything went smoothly, apart from Xander cutting all his knee and leg in three places which had to be cleaned daily and bandaged up, so that kept him out of the pool. On our last Disney trip which was to Magic Kingdom Xander had been feeling a bit rough for most of the day but by the evening he was screaming in agony and wanted to go away from everyone, so while everyone else was enjoying the fireworks and seeing tinkerbell fly we were sat near the entrance/exit away from the crowds. I was in the wheelchair that we had for him and Xander was wrapped up in a blanket on my knee and I was trying to keep him comfortable. The team doctor and one of the organisers wanted to get Xander back to the apartments to get him checked over so we left the park early and were taken back in the team car rather than wait for the coach. We think that he had picked up a bug which wiped him out for a few days and we also started him on some antibiotics incase he had something bacterial going on. We all had an amazing time and have some treasured memories, the boys were so looked after and made to feel so special. Since we have been back Xander has been generally well. We’ve had a few moments where we’ve seen every hour in the night with Xander in pain with his stomach and he’s not really eating. Everyday his lunch box comes back from school untouched and I just wish that they would do some more investigations as to why he is always in pain with his stomach. Killian still hasn’t been seen by an OT yet and I’m getting nowhere fast with them but I keep trying. The boys finish school next week for Christmas and I’m looking forward to spending time with them and having a lovely family Christmas together. I would like to thank everyone who sent the boys some post/gifts etc this month, including, Marty, Natashja, Pia, Gabe, Karen, Kay, Calam, Jake, Kerry and Mark, Jenny, Meg, Michael and Maria, the students at Nottingham University, Santas reindeers and Elves and also to Christine for the lovely Manchester United vintage shirt that she had made for Xander (he loves it and wears it as often as he can), and lastly to the Post Pals team who I received a lovely box of chocolates from this month which was very kind. Thank you to everyone who has been so kind to my boys this year and I hope you all have a lovely Christmas and a very Happy New Year. We had Xander’s appointment with his immunologist this month. He is still concerned about Xander’s stomach problems and the fact that he’s not really gaining any weight (he’s 22kg). He suggested that we stop his brown preventative inhaler and his antibiotics to see if his stomach issues stop. Up to now I have seen a small improvement in the fact he’s complaining less about his stomach, but then on the other hand he’s hardly eating, which isn’t good regarding how little he weighs already and the fact that he looks so gaunt at the moment as he seems to have lost more weight. He is going to be having a long course of his medicine on Friday 25th which will last three weeks instead of the weekly doses. This is just a one off, so I wait to see how that affects him. Killian seems to be starting to go through ‘teenage years’ early and his attitude is becoming quite a handful some days. He seems to have gone backwards on some of the things that me, the school, and his OT, have got him to do over the years, such as writing etc, not helped by the fact that his OT has gone on maternity (third OT to go on maternity in as many years) and that no other OT has been assigned to him. I’m having to fight to try and sort it out. The boys have had some lovely cards, postcards, magazines and gifts this month. Would like to thank Maria, Toni and Karen, Lotus, Jake and Jordan, Zach and Rhodes for their post/gifts this month. The boys really do appreciate it. Well it was school holidays this month (August) and we had a relatively quiet time. We took the boys out to Chester Zoo as they love all things animal related – especially Killian who loves to find out all the information he can regarding animals, the more dangerous they are the better! We went to the pictures each week and did bowling numerous times as well as the parks and visited relatives. We try to keep things simple with Killian not liking change too much due to being Autistic. Both the boys were generally well during the holidays, apart from the usual puzzling stomach complaint that Xander has and his throat which is always sore – staph infections that Xander suffers from a lot. We are at Xander’s 4 month appointment next week so we will see how his blood levels and his immunity is then. The kids went back to school this month – Xander in to year 3, Killian in to year 6 and Louis started sixth form (boy, am i feeling old). Xander’s teacher has said to me what a lovely boy he is, that he’s hard working, cooperative and has the patience of a saint, which I put down to all the years of having to settle for 1-2 hours at a time, twice a week, whilst he has his medicine. Killian is in his last year now of primary school which is very daunting as it is so hard to choose a school for him and I’m worried how he will cope with high school as he’s struggling at below the level he should be now. We had a surprise recently, we were contacted by ‘Child flight’ charity to say that Xander had been nominated by his immunology nurse to go to the USA to Disneyland etc. Well, he got a place, so the whole family will be going there for 13 days at some point this year. For those of you who have noticed that I have posted about not being well lately, well I have been diagnosed as having epilepsy, so some of my problems have been down to that, but I also had to undergo an operation recently and possibly another one at the end of the year/start of next year, depending on the outcome of the last operation (not epilepsy related). I would like to thank those of you who sent me cards saying ‘thinking of you’ as it was nice to know that people actually care. I would like to thank those of you who have sent my boys post this month, with all that has been going on lately they very much appreciate it. Special thank yous to Lisa, Sam, Sami(Karen), Jordan, Christine, Sarah G, Natashja, Derville, Martin, Maria and Michael. Apologies if I have missed anyone out but the boys have muddled all their post up so I had to try to work out which post came this month. Apologies for the late update but I have been struggling with illnesses lately and somedays find it hard to be on the computer without it making the illness worse. Xander has had a fairly good run of good health, we’ve had the usual complaints about his stomach which the hospital don’t seem to be able to get to the bottom of, but hopefully one day we will find out what is causing him the pain. The good weather is a double edged sword for him as well as it helps to keep some of the bugs at bay and he always seems not as bad in the sun (apart from air-conditioning which is actually very bad for him), but it also wipes him out so by 7pm every night he is snoring (if not earlier). He has been enjoying some time in the garden as we bought a large pool for the boys to play in, but we haven’t really been anywhere recently due to me being so ill, although both boys have been asking to go to see Despicable Me 2 soIi will have to find some energy to take them to see it. Killian has been quite well, he has had some problems with his feet in that his osteo chondroma has been playing up and hurting so somedays he can’t even get his shoes on, that and ingrown toenails again, apparently down to the shape of his toes they think down to his hypermobility. He is also finally seeing the Occupational Therapist again, and his paediatrician wants him back at physio for his joint. I know that Louis is too old for Post Pals now but I thought you might like to know that he recently finished school and that he has also just come back from a football tour in Holland where his team had 3 matches against local teams and they won all 3, scoring 47 goals over the 3 matches and conceded non – I am a very proud mum. On to the thank yous, I would like to thank everyone who took the time to write to my boys, they enjoy reading about your lives and especially different countries from around the world. Last month we had cards/letters from China, USA (numerous states), Australia, Spain, Ireland, Singapore, Germany and of course the UK. Also, thank you Nathan and ‘Meadows First School’ for his lovely card. After Xanders admission to hospital at the end of last month he has been up and down. He has been very tired and not really eaten very much which isn’t great as he is extremely skinny anyway. This morning he also woke up complaining of sore underarms and on investigation his lymph nodes were swollen, so at the moment we are waiting to see if he develops something or whether it will pass without infection. With all the talk of measles about at the moment it is quite a worrying time as Xander hasn’t had any of his vaccinations as he is not allowed any. We are hoping that he doesn’t come into contact with anyone who has it, or that it doesn’t come into the local area as if it does we will have to keep him house bound and away from school which will be a shame as he loves school. Killian had a lovely birthday at the end of April for which he got lots of Lego and a Moshi Monsters cake which took me ages to make as he doesn’t like shop bought cakes. He has been having some soreness in his joints again so we have an appointment to see his paediatrician this month regarding it. I would like to thank everyone for their lovely cards, letters and gifts, that they sent this month, including – Kati from Finland, Ms C Brown, Natashja, Claudine, Lawrence Family, Sarah G, Karen (sami), Maria and Michael, Samantha from Australia and Teresa. Xander was also sent a diamond brothers book and a Moshi Monsters t-shirt which he opened at his Nana’s house and unfortunately they didn’t keep the packaging so I don’t know who they are from to say thank you for them, so apologies, but thank you very much for the items. Apologies for the late update but I’ve been ill lately. Xander has had an up and down month in March. It started off quite well and he was doing okay and then half term arrived and he became quite ill and ended up in hospital. Luckily he was released on Easter Sunday, not that he likes chocolate anyway. He seem to be over the worse now but he is still very up and down, that much that we haven’t really done anything for the school holidays, although hopefully i will get to take him and Killian to see the Croods before they go back to school. Killian has been fine this month enjoying his time away from school, and enjoying his Easter eggs, hes very much an ‘at home’ child who likes to just stay at home all the time if you let him and he doesn’t like being where there are lots of people. I would like to say a big thank you to everyone who took the time to write to the boys or send them something, they appreciate every piece of post they get. Xander has been up and down this month. He seems not too bad in himself but he has had a few infections and is plagued with mouth ulcers at the moment which isn’t great as it is putting him off eating and there is nothing to him as it is. We couldn’t make his appointment at the hospital last month so up to now there’s no change in his medication or dosage, but I am wondering with all the illnesses and infections he has been getting if it is time for an increase. Killian has had a good month health wise. The hospital confirmed that he doesn’t have XLA (the same as Xander) but what I was hoping for was that the hospital checked all his immune system and not just the bit that doesn’t work for Xander. However, it will have to wait until we see Xander’s doctor in April. I would like to thank everyone who wrote and/or sent the boys something, they appreciate all that they receive and have had some lovely post this month. Thank you. Sorry for not updating recently but it has been extremely hectic and I’ve not had time for anything lately. Xander has had a few complaints since last time I updated. We’ve had chest infections and the staph is back in his nose again which makes him poorly, and he is on antibiotics again, though I am thankful that we managed to get through Christmas without anything major. He is still suffering from daily problems with his stomach and the medicine from the hospital isn’t working so we’re kind of stuck at the moment as the doctors are baffled. His feet are just the same at the moment but we have to go back in April for another review. Killian has had lots more problems since my last update, he had an infection in his toes and had to keeping going back and forth to the podiatrist as he had a dressing on them and antibiotics, he couldn’t walk and they were extremely sore. He also got more abscesses in his mouth and was really poorly with them. He had his bloods taken and we are awaiting the results to see if he has an immune problem. He is also about to start a course of Occupational Therapy on Tuesday to help with his coordination etc. Christmas was hectic due to some personal problems so everything had to be done last minute, but the boys enjoyed themselves and got lots of lovely presents, their best being Nintendo 3DS XL which they take everywhere with them. They also got lots of Lego which is everywhere as there is nowhere to put it – there is that much! The kids love Lego though. Many thanks for all the Christmas cards that the boys received, they were all stuck on to my fireplace and were read over and over. Also, thank you to all the Reindeers!! They loved the letters! And last but not least, thank you to the Elves for their lovely presents, they loved them all. Xander has had a relative good month in October, his stomach problems are ongoing but we do have more medication from the hospital to help relieve the pain. No news has come through as yet regarding his foot (tumours) so i am going to chase it this week just incase they have forgotten about ringing with the results. It was his birthday in October so we went to Nandos for his birthday and he got lots of lego which he loves building at the moment. In his room we have had to add another two shelves just to put his models on. He received lots of cards from his Post Pals friends which was lovely and they were all over the living room. He also received lots of handmade cards from Student Union, university of Nottingham, which was lovely that they took the time to make them for him and were all brilliant, so thank you. I would also like to thank Rissy, Harry, Lola, Dottie, Natasja, Tracy, Jenny, David Chatterton, Catherine, Amy, Bev, Andre, Kate and Sarah. Hopefully i haven’t missed anyone, thank you for all your letters and gifts this month as they mean a lot to my boys. Well, we went to Xander’s appointment about the MRI results, but the radiographer hasn’t done the results yet – apparently there are over 300 pictures for him to study and the hospital said they will ring me when the results are in, so in my mind, no news is good news. He had his ultrasound and nothing major was found, but the day they did it he had no stomach problems! He’s still having the stomach issues and the doctors want a few more tests done – they are considering at the moment that it might be some kind of anxiety causing the problem and since Xander has a real issue with death it may be the cause, but we have to rule out everything else first before they can come to that conclusion. Killian hasn’t been back to have his bloods done yet but I am hoping that it will be in the next week or two as I would like some results sooner rather than later. Xander had his birthday yesterday. Unfortunately it was a school day, but we managed to have a nice meal at Nandos and i made him a moshi monsters birthday cake. Louis was at his open evening as well ready for college next year (I can’t believe how fast time is flying). It doesn’t seem 5 minutes since he was a toddler causing mayhem and now he’s 16 and towers over me and is so grown up. I would like to thank everyone who took the time to send post to my children this month, including Teresa, Laura, Dottie, Claire, Harriet and S.T.O.M.P dance group who sent some lovely cards and a dvd of their dance routine. All the post is very much appreciated. August has been an up and down month. Xander went to clinic to see how his Osteo Chondroma (benign bone tumours) on his feet are going, however rather than hearing ‘everything is the same so come back in a years time’, this time we had a problem. One of the tumours looked like it has grown and Xander needed an Mri to find out what was going on, so we have just had that this week and the results are in about 2 weeks time. He has also been suffering with stomach issues lately as well which is being monitored, but we were told if continues for the next couple of weeks he will require an ultrasound to see if they can find a cause. Bloods have been taken this week as well. Killian is also under investigation for an immune problem, bloods were done but the labs didn’t do all the tests so he needs to have more bloods done to test other areas of his blood. Amongst all the illness, we did however manage to have a coupe of trips out as we couldn’t go away on holiday this year. We had a day at Blackpool Zoo and then into Blackpool itself which was nice and we also went to visit a castle which the little ones enjoyed. The kids got some lovely post this month, lots of postcards from lots of different people, and some nice gifts for all three from Natajsa and Claudia, thank you. Xander has had an up and down month with some illnesses keeping him off school again but luckily nothing too serious. Killian had had some illnesses as well requiring antibiotics again so they have decided to check whether he has the same illness as Xander. We don’t have any results yet though. In terms of medication we seem to have taken 3 steps backwards as Xander is having a hard time accepting his illness again and is fighting his medicine and trying not to have it (screaming, shouting etc), but unfortunately he has to have it so we are having to be forceful again. I would like to say a big thank you to everyone who took the time to write to the boys this month, they appreciate every bit of post. It has been a bad month for us this month. Firstly, I was admitted to hospital and spent over a week in there having lots of tests done and on lots of medication, some that wipe me out completely, so I’ve been having to rest ever since. My hubby had to take 4 weeks off work to look after me and the kiddies. Whilst I was in hospital Louis was taken into A&E after having an allergic reaction to some tablets the GP had given him, then Killian got Slapped Cheek and was ill with that and a cough. Then Xander came down with Croup and a chest infection and a cough which (two lots of antibiotics later) has nearly cleared up now, so the Easter Holidays off school have been a bit of a downer for us. We did manage to get a nice easy day at Chester Zoo using some vouchers that Killian won last year, with Xander well wrapped and sat in Killian’s maclaren major buggy that he has for when he has pains in his legs. I would like to say a big thank you to Rachel, Kim, Yvaine, John (from Whittington school), Charlie Baker, Emma Turner, Sandra, Libby, Debbie Turner and lastly Teresa, who always cheers Killian up with her post. All your post is read numerous times and cheers the boys up. It has been a relatively quiet month for the kids this month, all the health issues have been with me this month so its been hard going as I’ve spent the best part of nearly two weeks in bed suffering with a stomach ulcer. Xander got some lovely cards and gifts from people this month, including a lovely elephant picture, a cars colouring set and also a wall chart. The younger boys have been having their room done up this month as they wanted something a bit more grown up apparently than Disney’s Cars, so they have opted for a big map of the world and four clocks which we have written different countries underneath so they know what time it is in different places. I’m just trying to find some flags stickers and they will be happy as they like to learn about places around the world. Killian started swimming this month with school and we were unsure about whether he would get into the water as he has a fear of water, but with some coaching he has got in and has managed to try to swim which is a big step for him. Xander still is having problems with his fear of death and has now stopped sleeping in the dark so we have to leave the light on (something that he’s not had since a baby) just hoping that he will grow out of it. I would like to thank Teresa for her lovely post that she sends Killian, he loves all the letters and gifts that he gets, also thanks to Rachel, Rebecca, Dottie, Heather (in Cyprus) and the person who sent the Mr maker set for Louis and Killian, i have searched for a letter etc for a name but i don’t know if one of the kids threw it away with the packaging, so apologies. Xander has had his ups and downs in January. We started the year positively, then he developed a bad stomach and was sickly for a while, then he got a urine infection, and then we had a trip to A&E with a suspected broken finger. Luckily it wasn’t broken but his older brother Louis has been warned not to kick the ball at his brother so hard. It doesn’t help with the weather being so cold at the moment as xander feels the cold a lot more than the rest of us and gets a lot of joint pain when it is cold. We have had his school report this month and it was mostly positive except for his attendance – he apparently has persistent time off and local authorities have been informed. Unfortunately, like the other parents on Post Pals, we can’t help our children being ill and having more time off than others, we certainly wish our children were well enough to attend school all the time. Xander has also developed a fear of death at the moment and it doesn’t matter what you say to him, he thinks he’s going to die all the time and he doesn’t want to grow up. We’re treading carefully at the moment with him as I think that this might be the start of him actually coming to terms with his illness. We’ve never hidden anything about his illness from him and he is informed of everything that goes on regarding his illnesses’, so we will just have to see and hope that it’s a passing phase. Killian and Louis have both been well in January and I hope that continues this month as well. Well we’re at the start of the half term so hopefully the weather will be good enough for us to get out and have some fun. I would like to thank everyone who took the time to send a card/letter or gift to my 3 boys, including Dottie Dalmatian, Teresa for all the lovely cards and gifts that she sends to Killian (he enjoyed making and eating the cakes by the way), and Louise M for the card and colouring pictures for Xander. Well, Xander has been generally well this past month which i have put down to the unusually warm December that we’re having and the daily antibiotics that he’s on at the moment. We managed to get to the pantomime and to see Father Christmas this year, something that we hadn’t managed last year due to one illness or another. We also had a quiet Christmas day which was nice. We visited Xander’s grandparents as his granddad had just had an operation and couldn’t come to us, then we came home for Christmas dinner and a quiet afternoons playing with the toys. His favourite was his CD player as he has really got into music at the moment. Killian only wanted books and dvds so that was mostly what he got and Louis wanted an ipod touch so Father Christmas got that as well. Well, to the thank you’s… firstly i would like to thank the Post Pals team for their hard work this year, to Maltby Academy for all the lovely gifts and cards that the pupils and teachers sent the boys (you really are a truly wonderful school and you should be very proud of yourselves), Xander also loved Percy the Penguin and we’ve been to the build a bear for more clothes for him since. I’ve never seen the boys so surprised when they opened the boxes. Also, a big thank you to the ‘elves’ and the ‘reindeers’, the kids are still racing the reindeers as i type. Anther big thank you to Jenny, Sarah, Teresa, Dottie, Gill, Elske and Linda and to everyone else who took the time to send the boys a letter or card or a lovely gift. You all make my boys smile which is what this charity is all about. Hope you all had a lovely Christmas and hope you have a wonderful New Year. Xander has been generally up and down with his health this last month; he has had a week off school and been to A&E already since being back at school. We had to see his immunologist last week as the antibiotics that he has don’t seem to be working anymore and he was getting repeated infections, so we are now trying a different antibiotic which, fingers crossed, works for him. He is only to take it for 3 days out of 7 as it’s a long lasting antibiotic, but the first week I haven’t seen any change in his infections though I am trying to be optimistic. He’s enjoying being back at school with his friends and he really wants to learn all the time and loves books. He misses his friends a lot when he can’t go into school. Killian has recovered from his broken arm, although he did fall on it the other day and I was concerned as he refused to use his arm for a couple of days, but he’s back to using it ok now – luckily. We’ve seen the doctor about the lumps on Killiian’s feet and now we are just waiting for the ultrasound of them which is to be done in December. I would like to say a big thank you to everyone who took the time to write to my boys, including Sarah G, Dottie Dalmatian, Teresa, Rachel, Tashi. The boys have received some birthday cards but they haven’t opened them yet so I will send big thank you’s your way next month. Well we managed to get away at the beginning of August; two weeks in sunny Tenerife were definably what the doctor ordered. Xander was well for most of the holiday, but the air conditioning in the apartment made him chesty and gave him a cough. We had taken the precaution of taking antibiotics with us, along with all the rest of his medication, which makes for fun when getting through security. Xander saw the specialist about his bone tumours this month and she was pleased that they haven’t grown into the bone, that no more had appeared, and that the ones that are there have not got any bigger. We have to go back next year for repeat tests unless we notice any difference with them. Unfortunately the same doctor who diagnosed Xander wants to see Killian’s feet as he has lumps on his feet. It may be a coincidence but it may mean that its hereditary and that both boys have osteochondoroma. Killian’s arm is much better after he broke it. It has mended well and the physio that he was seeing for his legs and stomach muscles is now seeing him for his arm as well, which is good. We also took Killian to see Jenson Button in Manchester city centre last week and he absolutely loved it, he is cars mad so F1 is right up his street. Both boys were back to school today and already Xander has come home telling me he doesn’t feel well. He is very whiny and I’m just hoping that its tiredness and not something starting already. We had this last year where he spent most of the autumn and winter off through illness. We’re at the PIA meeting (primary immune deficiency) on Saturday to hear how they are progressing with finding cures for illnesses like Xanders. Although some are already curable through bone marrow or stem cell, Xander’s condition is a long way off being cured as they haven’t found a way in lab studies yet, but we’re hoping they might have some more information on the subject for us. On to the thank yous. I would like to say thank you to all those people who took the time to send my boys post/gift, they appreciate every piece of post they get and look forward to receiving it. Also a big thank you to Post Pals for the large box of gifts that the boys received, they have made scary aliens, and dug up the dinosaur bones already, and it kept them quiet for the afternoon. Xander has had some more diagnoses this month to go with his illness. He was diagnosed at the start of the month as having Osteochondoroma which is benign tumours – at present he has 5 but some of them have only just appeared so he could potentially get quite a few. Apparently they don’t stop growing or coming until he’s about 16, so time will tell if he gets any more, how big they will get, and if he will need any removing. He was also diagnosed with having Asthma which he is on a preventer for twice a day. He’s not been that great in himself so we’re back on the antibiotics (strong ones) for two weeks and then he’s got to have some others for months to try and keep him from getting infections. Xander attended the Post Pals party and enjoyed himself, especially on the inflatable slide and the bouncy castle. He also won three raffle prizes which was nice. We’re going to see the new Transformers movie this weekend and have lunch out as long as he’s okay, so it will be nice to go out as a family. Thanks to all those who sent Xander and his brothers post this month, it is much appreciated. Xander underwent his operation on his foot which they thought was a cyst; however the operation didn’t go according to plan. Since the op he has had to have an ultrasound scan to see if it could throw some light on the situation. It turns out that the lumps on his foot as caused by the cartilage expanding in certain places and he now has 3 lumps on one foot and two on the other. We have to wait to see the specialist but we have been told it could be very likely he has a condition which means the cartilage in his body expands and can cause him a lot of problems. So we are waiting to here what the doctor has to say on the matter. He’s at the hospital for his quarterly year check up next month and they are going to check him over as he keeps on getting bruises on his stomach and back. Hopefully it’s nothing too serious though. He has also had the staph infection back in his nose so he’s been on the strong antibiotics again; just wish it didn’t keep on returning every few weeks. Killian has started school this week. He is only going a couple of times a week for starters as they are not sure how his autism is going to affect him in class, but he seems to be enjoying it though. He also had his birthday at the end of April and had a pool party in the back garden with his cousins. The weather was great and they enjoyed it. I would like to thank all those who take the time to write to my boys as they love receiving letters. Well, where do I start with this month‚ its been hectic with appointments, some weeks I had appointments with the kids every day, and we also had the ashes ceremony for their granddad this month at Old Trafford. The kids have had some minor illnesses between them (me included) but nothing major to report. Xander has started getting some bruises in some places, like his back etc, so we are having to monitor them at the moment as it should be that his blood isn’t binding properly, or it could be something completely different. We will wait and see, but if he gets more they want to do some blood tests on him just to rule anything nasty out. The kids had a quiet week off school, we went to the pictures to see Yogi Bear but didn’t really do very much else, though I did get some professional pictures done of the kids too which are due to be collected this month. Xanders run of illnesses is spreading itself out now that the weather is starting to pick up, so fingers crossed that it stays that way. March is going to be a busy month. We have Killian’s appeal for school (fingers crossed that we win), Xander has to have the cysts on his foot removed on the 21st so he will be having a general on that day, Louis has started a chef academy program each Saturday where he’s learning the basics of becoming a chef (that’s what he wants to do), and the disabled facilities grant people are starting work on Thursday to put a toilet downstairs for Killian, which will be messy as they are having to dig down a few feet in the hallway for the pipes etc. We’re just hoping that all the muck and dirt doesn’t cause Xander too many problems. Last but not least, I would like to thank everyone who took the time to write to my children this month as it is welcomed with big smiles and read over and over with such joy, so thank you. Well the start of the year didn’t go too well for us with Killian being admitted to hospital after his face blew up on New Years Eve caused by his abscess. The second lot of antibiotics brought it under control, but he now has to have his tooth removed as the abscess is deep in the jaw. The tooth is actually okay it’s just that they need to remove it to clean the abscess out and he will have to go under a general to have it done. Then on the 12th January Killian again became unwell and after a visit to the GP’s they sent him straight to the hospital where it was discovered that he had viral meningitis. It was only a mild case, so after a day in hospital he was allowed home to rest. The symptoms lasted about 11 days before he was back to normal again. 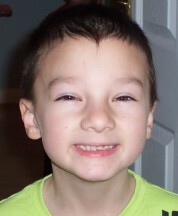 Then on the 21st we were told that Killian has Autism with development delay and speech and language delay. To be honest we already knew, it was just getting a diagnosis that was the problem, as he had already been told ‘maybe’ by one place, so we went to a different centre who did some more testing with Killian and they came back with ‘Yes, he is Autistic’. We are due next month to discuss everything and how the future will look and how to handle Killian with the specialists at the centre. However, Xander has had a good month this month, apart from his cold returning again, and a few sicky nights. Nothing major this month for Xander, but we are in with his consultant next month so we will wait for what he has to say – should have been this month but his consultant got stuck in Germany due to the bad weather. On the 24th though we did get some more bad news in that their Grandad (who lives in Spain) had died. So all in all we have had a shocking start to the year, that has been incredibly busy with an appointment of some sort nearly every day and lots of bad news – including that my credit card had been hacked, so if there ever was a time when you want to rewind the year and start again then this month has been that time. Roll on next month and hopefully we can put all this bad news behind us. I just want to add a thank you to all those people who took the time to send my children some post. They loved the aeroplanes and the flying bugs and the car crashes dvd, and Killian has taken all the pictures on the Ben 10 camera sent to him as part of the memories theme and we just need to get them developed. The cake mix is about to be done today as we’re having a baking day, so thanks to everyone as my kids really need to be cheered up at this moment as it has been a bad month all round. Firstly, to start the year off, I would like to wish every one of you a very Happy New Year. Xander had his ups and downs last month, but luckily we managed to get him sorted after trying out a couple of different antibiotics. He wasn’t very happy or very well at times but by the end of the year he had got over the worst of it. We had a lovely quiet (well kind of) Christmas, the boys were up at 7am and ripped open their presents. All of them were well so I couldn’t have asked for more. After Christmas, Killian started with a sore mouth which turned out to be an abscess in his jaw (quite deep). It took two lots of antibiotics and a trip to A&E on New Years Eve (after his neck and face ballooned) but the antibiotics worked eventually. However, he has to go into hospital to be put under general to have his tooth removed and his abscess taken care of which we should hear about in the next two weeks. Since the New Year we have had an appointment for something or other everyday (once we got the bank holiday out of the way) and some days two, so it has been quite an eventful month already. Killian has finished his assessment at the Autism centre and we will get the results back on the 21st January. I’m not sure what result I would like the most as although I don’t wish Killian to be autistic, I would like some answers for the way he behaves and the mannerisms and the reasons he does those quirky little things he does. So, what will be will be. Now to the thank you’s. As always I would like to thank the people who send my boys post on a regular basis and to let you know that it is very much appreciated, so a big thanks to Teresa, Rachel, Mandi, Sarah G, Dottie Dalmatian and Naomi. I would also like to say a big thank you to Maltby Academy in Rotherham who made some lovely cards and sent some gifts to xander, he truly loved each and every card and they took pride of place on our wall, along with all the other cards sent by the friends of Post Pals. We have never had so many cards and we ended up with 10 lines of cards around our living room. I would also like to say a big thank you to the person who sent the remote control mini for Xander – we’re not sure if it came from Cadburys (the frank mark on the front of the box had Cadburys, Bornville written on it), but as there was no letter/card in the box we weren’t sure who exactly the car came from. To every one else who took the time to write, including all the ‘Reindeers’, I would have liked to thank each and every one of you personally, but as he received over 50 letters, cards and gifts, I don’t think I would have enough space for Xander‚Äôs update. However, you know who you are and THANK YOU. You are all lovely kind hearted people. October hasn’t been a great month for Xander, what with numerous appointments, including one for surgery on his foot which he has been scheduled in for, but also put on their emergency list incase they get a space in theatre. He’s also had a nasal infection which isn’t pleasant for him and he was put on antibiotics for it. This then led to an upset stomach and you can gather what it caused him to have for nearly a week, not good when he’s already very skinny. He then went on to develop a cold which then turned into croup. This isn’t great for him as there is the risk of it turning into pneumonia, so the decision was made to take him into hospital with it. At hospital they could only monitor him as he can’t have steroids due to his immune system problems and he was already on antibiotics, so monitoring him was all they could do for him. Luckily it cleared up in about 5 days but then it passed on to his brother Killian, so we’ve had a germ infested house for a good few weeks now. Apart from the above, everything else has been okay. He had a quiet birthday for which he got a vtec camera and he has taken loads of photos with it. I want to thank everybody for the lovely birthday cards which he received; they all took pride of place on our cabinet in the living room. I also want to thank everyone who has sent Xander and his brothers some lovely letters, cards and gifts, which include the Halloween goodie bag, Ben 10 doll, dvd, Toy Story pencils, socks and chocolate eyeballs, a scary bouncing egg, a Lamborghini poster with Killian’s name on the number plate (he loves it), lots of jokes handwritten (the kids think they are hilarious and keep on telling everyone them) and the bracelets that were made for them. You all are wonderful people and make my kids smile with every piece of post that arrives. They all have their own special Post Pals box which they keep their post in and it really does help, especially when my children are unwell, so thank you. Firstly I would like to say a big thank you to everyone who sends my 3 children post as it really keeps them smiling. Thanks especially to Teresa, Samantha, Mandie, Sarah, Rachel, Liz (it was very kind of you to knit the red dinosaur and it sits proudly on his bed), and not forgetting Dottie Dalmatian. Hopefully I haven’t missed anyone out. Xander has started school since my last update and is loving it. He has to have his little bottle of antibacterial gel strapped to his side and is constantly washing his hands but luckily we have managed to ward off any nasty germs affecting him as yet, though I do dread the winter months. We had a close call when my nephew developed shingles a couple of days after us visiting him, but luckily Xander was okay as the spots hadn’t appeared whilst we were there. We had a problem last week with Xander’s infusions as he is on blood plasma infused over 2-3 hours twice a week, but unfortunately the needle didn’t want to go into his skin and when it did managed to he was in immense pain, so we had to give up and try again another day. This isn’t good because the longer between infusions the more likely he will catch something. We’re hoping it is a one off but we think he might have to start using a different part of his body for infusions soon to give his legs a break as the skin is hardening, but it is trying to find a suitable place for the infusions as Xander is really skinny and the needle really needs to go into a fatty part of his body. We’ve got quite a few appointments this month between Xander and his brother Killian, as Xander’s got the appointment we have been waiting for about surgery for the cysts he has got on his foot – I do hope they remove them soon as they do cause him a lot of pain, mostly at night. Killian’s got genetics and autism testing and back to physio again this month as he has lots of things wrong with him but the doctors would like to find out if there is a link and a diagnosis for him. Take last week – he couldn’t walk for a couple of days after popping his knee joint out (that’s hyper-mobility for you) and his dyspraxia makes life difficult for him anyway, but he grins and bears it and gets on with life. Louis is doing really well at school this year, he’s earned loads of merits already and is set to sit some of his GCSE’s this year, so it is hectic for him but I think he’s up to it. Anyway, just to end with a big thank you once again to everyone – it is very much appreciated. Xander has been generally well this month, though he’s had quite a few bangs, cuts etc to have to deal with. Though he has woken up this morning with a rough cough and dribbling nose so I’m hoping that it is not going to turn into anything nasty (as very often happens when Xander gets coughs and colds). We’re still waiting to see the hospital specialist about his foot as there was a mix-up and they sent us to the wrong surgeon, so the next available appointment is the 18th October though they are trying to reduce this to an earlier date. Good news this month is that he has got a place at primary school on appeal (it was a worrying time not knowing), so he should start next week after we have had a meeting with the head and put some measures into place regarding Xander’s health. Killian hasn’t been too great this month after catching a bug that he can’t shift, but apart from that he’s okay. Louis went back to school this week, think he was glad to see the end of the 6 week holidays as he was missing his mates. Good news is that he’s in the top set for his subjects and apparently they can now take their GCSE’s in year 9 if they’re in the top set, though I’m not too sure of this. Well on to the Thank you list and there is a lot! Big thanks to Teresa, Arlene, Charlotte, Maria and Michael, Dottie Dalmatian for letting us have a pup (he’s been named Dougie), Alison, Rachel, Samantha, Murphy the Gnome, Kim, Sheelagh, Else and Mandie. Sorry if I’ve missed anyone out, but thank you to each and every one of you for putting a smile on my childrens’ faces, it is very much appreciated. Xander has been mostly well this month with only a few little hiccups, but nothing too bad that we couldn’t handle. We had his 6 monthly review at the hospital and all seems well. His medicine dose hasn’t been increased just yet so this is good for him, though he has got some cysts on his left foot that have been causing him real pain, especially in an evening once his body starts relaxing. He can scream for hours and calpol and ibuprofen doesn’t do a great deal but we try massaging the area as well which does seem to help a lot. We are to see the surgeon on Friday 13th to see what he thinks and to talk about having them removed, which will be good in once sense but he takes longer than average to heal and an open wound isn’t the greatest thing for him to have, but it needs to be done. We had a bit of bad news as well this month, as having heard nothing from the schools admissions, I rang to find out what was happening and was told they were sorry that we hadn’t been told anything as there was a computer error and some people didn’t get the letters, but Xander had been turned down for a place at our chosen school and that he was 32nd on the waiting list, so we have to go to appeal on the 3rd of September, but it doesn’t look good (fingers crossed though). What gets me is that Xander needs a school where I can be confident in the staffs abilities to be able to deal with Xander quickly as even getting a cut dirty can be serious for him. We also need the school to be not too far from home or too far from his hospital. The only other school they offered as an alternative is two bus rides away and in the opposite direction from his hospital, so it may be that he has to be home educated like his brother Killian for the time being until they have a place for him. On a good note, we’ve been away to Center Parcs this month which the kids love. We didn’t get too wet either and had just one day of rain. The two youngest even had a go at kids crossbow which was good fun to watch and I got talked into going horse riding which wasn’t as bad as I expected. We also went out on a double canoe on the lake which was a laugh and we were singing this tune to Hawaii five-o whilst rowing. Killian’s Maclaren Major buggy arrived at last as he has very hyper mobile joints, low tone, dyspraxia and a few other things wrong with him as well as his learning difficulties, so we can now put him in the buggy when we go out as his legs hurt very quickly once he starts walking around. He’s even got a transformers seat cover for it as well. Xander and the boys have had a good deal of post from Post Pals buddies this month which are greatly appreciated and the boys look forward to the post being brought to them, so thank you to all of you. We’d like to thank everyone who sent Xander and his brothers some post this month; you are all very kind and thoughtful people. This includes S.R Gilligan, Rachel, Jodie (he loved the Phineas and Ferb stickers and the colouring set), Sarah G for her numerous letters and postcards, Lauren and Phil for your talented handmade cards which were fab, Susan, Percy the dog (who knew dogs could type!! ), Kim, Betty Graham whose card and stickers came all the way from Australia and he hasn’t opened the stickers as he says they’re special as they have come from another place far far away and wants to keep them, Margaret Baldwin, Teresa, and I’m really sorry about this but not sure whether the name is Jake or Jane who sent the pictures from their farm of the baby lamb. I really hope I haven’t missed anyone out, but if I have, a big thank you to everyone. Post Pals has been wonderful for Xander and his brothers, the thoughtfulness and kindness of complete strangers who take some of their precious time to put a smile on my sons’ faces is amazing. Words can’t thank you all enough.